Liquid fertilizers are made of natural ingredients and are used to reduce the plant growth interval and to increase the plant productivity. Further, liquid fertilizers provide extra nutriments to the plants and help them grow healthy. Global liquid fertilizers market is anticipated to grow at a robust compound annual growth rate (CAGR) of 2.9% over the forecast period i.e. 2017-2024. The global market of liquid fertilizers is primarily driven on the back of rising food demand across all regions. Further, booming population coupled with increasing need for precise farming in order to improve overall crop production are key factors which are envisioned to augment the growth of global liquid fertilizers market in future. In terms of region, global liquid fertilizers market is segmented into five major regions including North America, Europe, Asia Pacific, Latin America and Middle East & Africa region. Among these regions, Asia Pacific region is anticipated to lead the overall liquid fertilizer market over the forecast period. Presence of large base population and growing demand for food grains are key drivers which are fuelling the growth of liquid fertilizers market in this region. Additionally, government support and increasing awareness amongst the population regarding benefits of using liquid fertilizers are strengthening the growth of liquid fertilizers market in Asian countries. Furthermore, global liquid fertilizer market is segmented into ingredient type which includes organic and synthetic. 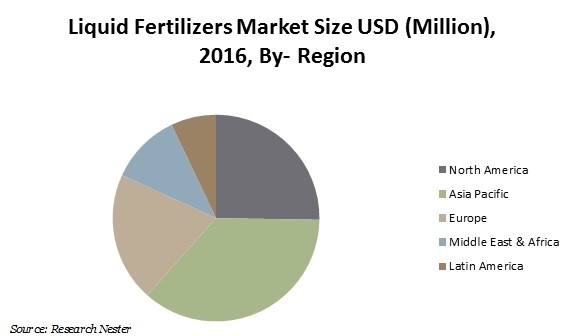 Further, synthetic liquid fertilizer segment by ingredient type dominated the global liquid fertilizer in previous years and is predicted to maintain this dominance over the forecast period. However, organic liquid fertilizer segment is likely to grow at maximum pace during the forecast period owing to its environmental benefits. Rising demand and consumption of organic foods all across the globe is one of the key growth drivers for global liquid fertilizers market. Population of various developed and developing countries such as U.S., Canada, China, India and others are adopting liquid fertilizers owing to the increasing demand for food. This factor is propelling the growth of the global liquid fertilizers market. Further, governments of various nations are encouraging the use of liquid fertilizers by subsidies and incentive policies. This encouragement is expected to grow the liquid fertilizers market all over the globe. This massive increase in usage of liquid fertilizers is providing many opportunities for the liquid fertilizers manufacturers to grow and diversify their portfolio. For instance, Indian government is promoting liquid fertilizers and has recently announced the initialization of liquid fertilizer plant in Chhattisgarh. The adoption of liquid fertilizers is increasing due to capability of biological organisms to battle weeds, insects and other various diseases that may harm crops and increase chances of soil contaminations. Apart from this, farmers are adopting liquid fertilizers to boost crop production and increase the profit. Although, presence of alternatives such as bio fertilizers and other chemicals and lack of awareness in rural areas are key challenges which may adversely affect the growth of global liquid fertilizer market in future.